Vertebroplasty and kyphoplasty are similar medical spinal procedures in which bone cement is injected through a small hole in the skin (percutaneously) into a fractured vertebra with the goal of relieving back pain caused by vertebralcompression fractures. It was found not to be effective in treating osteoporosis-related compression fractures of the spine in the only two placebo controlled and randomized clinical trials. The patients in both the experimental and placebo groups of the blinded study reported improvement in their pain, suggesting that the clinical benefit noted in unblinded trials is related to the placebo effect. Costs of the procedure vary between 3,000 USD and 16,000 USD depending on what is done. The effectiveness of vertebroplasty is in dispute. Two randomized and blinded trials found no benefit in those with osteoporosis-related fractures. The subjects in these trials had primarily non-acute fractures and prior to the release of the results they were considered the most ideal patients to receive the procedure, but after the blinded trial results were released vertebroplasty advocates pointed out that people with acute vertebral fractures were not investigated. A number of non-blinded trials suggested effectiveness, but the lack of blinding limits what can be concluded from the results and some have been criticized due to being funded by the manufacturer. One analysis has attributed the difference to selection bias. Some have suggested that this procedure only be done in those with fractures less than 8 weeks old; however, analysis of the two blinded trials appear not to support the procedure even in this acute subgroup. 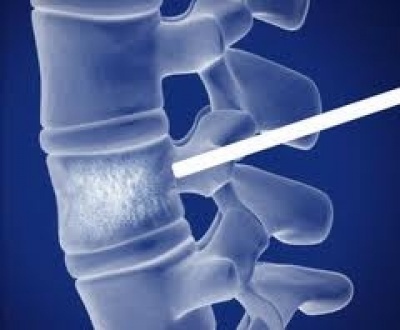 Others consider the procedure only appropriate for those with other health problems making rest possibly detrimental, those with metastatic cancer as the cause of the spine fracture, or those who do not improve with conservative management. The benefit noted in the blinded trials could be entirely explained by the placebo effect, therefore casting doubt on the benefit of the procedure for these other subgroups. Evidence does not support a benefit of kyphoplasty over vertebroplasty with respect to pain, but the procedures may differ in restoring lost vertebral height, and in safety issues like cement extravasation (leakage). As with vertebroplasty, several unblinded studies have suggested a benefit from balloon kyphoplasty. As of 2012, no blinded studies have been performed, and since the procedure is a derivative of vertebroplasty, the unsuccessful results of these blinded studies have cast doubt upon the benefit of kyphoplasty generally. Some vertebroplasty practitioners and some health care professional organizations continue to advocate for the procedure.In 2010, the Board of Directors of the American Academy of Orthopaedic Surgeons released a statement recommending strongly against use of vertebroplasty for osteoporotic spinal compression fractures, while the Australian Medical Services Advisory Committee considers both vertebroplasty and kyphoplasty only to be appropriate in those who have failed to improve after a trial of conservative treatment, with conservative treatment (analgesics primarily) being effective in two-thirds of people.